A suspected thief died after he attempted to run across three lanes of the M1 in Northamptonshire to try to avoid police capture and was struck by several vehicles, an inquest heard. Liam Mealing, aged 24, was killed after he leapt out of a lorry that had stopped on the motorway after it was followed by two police vehicles in the early hours of December 2 last year. 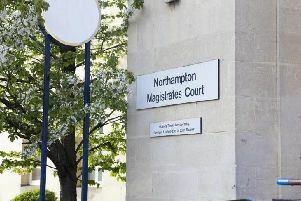 An inquest in the Court Room at County Hall heard officers were attempting to stop the Iveco lorry as it had triggered an Automatic Number Plate Recognition (ANPR) camera as a suspected stolen vehicle. Giving evidence, PC Lee Walker, who was a passenger in a police car being driven by his colleague PC Paula Foster, said the officers started to follow the lorry shortly after junction 15a northbound at about 3am. PC Walker said an officer in a dog unit van was also following the lorry, which contained Mr Mealing and another man. The inquest heard the lorry was travelling at abut 50mph and the officers decided to try to pull the vehicle over at the junction 16 exit. PC Walker said the officers put on the siren and flashing lights at the 300m exit sign and indicated to the lorry to move off the carriageway. However, the lorry did not take the exit and continued along the motorway. The police officers were given authorisation to continue following the lorry and PC Walker said the vehicle was “not driven erratically” and did not exceed 55mph. However, the lorry then braked sharply and came to a standstill in the outer lane nearest the central reservation. PC Walker said two men then jumped out of the driver’s side of the vehicle, climbed over the concrete barrier and ran into the southbound carriageway. The officer, who was visibly upset giving evidence, said he saw one of the men get hit by a lorry and then struck by a number of other vehicles. PC Walker said the other man managed to get across to the hard shoulder after narrowly avoiding a number of vehicles. He said the police officer in the dog unit van managed to get across the carriageway to detain the man but he then called for help. Giving evidence, PC Paula Foster said she believed Mr Mealing had been struck a glancing blow by one vehicle before being hit by a lorry. Collision investigator PC Martin Broughton of Leicestershire Police said analysis of Highways camera footage appeared to show Mr Mealing was clipped by a car before being struck by a lorry and then a number of other vehicles. The other male managed to survive after he narrowly avoided two lorries. PC Brougton said he couldn’t say definitively whether Mr Mealing was the driver of the lorry before both men exited the vehicle. In a statement read to the inquest, Faye Vollans, Mr Mealing’s fiancée and mother of his two children, said he was a caring father who had struggled to maintain regular employment as a warehouse operative. Ms Vollans said the night before he died, Mr Mealing had received a phone call asking him if he wanted to earn an “easy £500”. She said Mr Mealing, of Beeston, near Leeds, did not say where he was going or what he was doing. Ms Vollans said: “When I was told he had died it felt like my world ended. Mr Mealing’s mother Marie Russell said no words could describe how devastated she felt about her son’s death. Ms Russell said she knew her son did not have a driving licence but said she had leant him the money to buy a car as she believed he was a “good” driver. County Coroner Anne Pember recorded a verdict of accidental death. Ms Pember emphasised that none of the drivers of the vehicles that hit Mr Mealing could have done anything to avoid colliding with him. In a statement released after the inquest, Superintendent Steve Potter, of the ‎East Midlands Operational Support Service said, a 21-year-old man from Leeds who was arrested at the scene of the collision on suspicion of theft of a motor vehicle was on police bail, pending further enquiries. Supt Potter said an Independent Police Complaints Commission and a Professional Standards investigation had determined no action should be taken against the officers involved. He said: “Firstly, I would like to offer my condolences to Mr Mealing’s family and friends following this tragic incident. “The coroner has determined that Liam’s death was accidental, as a result of a road traffic collision. “A referral was made to the Independent Police Complaints Commission; however, following an assessment of the incident they determined not to pursue an investigation. A local Professional Standards investigation has taken place and determined that no action should be taken against those officers involved in this tragic incident.